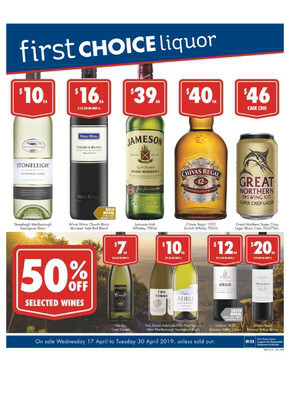 First Choice Liquor is an Australian liquor retail chain that specialises in the sale of red wine, white wine, sparkling, beer, cider, spirits and more. With over 75 stores nationwide and the largest range of liquor in the country, you’ll be spoilt for choice! 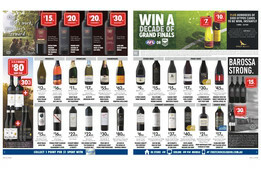 Shop online at First Choice Liquor to browse catalogues and weekly ads for hot deals. Shop at First Choice Liquor and enjoy the luxury of home delivery. Spend $150 or more online for free delivery or save time with Free Click & Collect. Simply shop online with no minimum spend, select Free Click & Collect at the checkout, and First Choice Liquor will text you when your order is ready to pick up! Shop online at First Choice Liquor and find the perfect gift for any occasion. Buy your loved one a Wine Accessories Gift Set for only $12 or get them a Festive Favourites Hamper full of tasty treats. Plus, add a First Choice Liquor Gift Tag to any item for just $2 so you can write a personal message. For up-to-date information on store locations, trading hours, and to browse the latest flyer, visit the Shopfully website today or download the app!